theory of the second best, incomplete markets, and nonconvexities. For each Laffont begins with the classical foundations, moves on to consider the topic within a simple model of the economy, and concludes by integrating results from recent journal articles into this simple framework. In this way students are led to understand the classical tradition in the context of modern general equilibrium theory. The book concludes with eight problems with solutions, each interesting and rich enough to be considered a case study, and nine exercises without solutions; together they provide an excellent review of material covered in the text. The basic approach in each problem is to set up a general equilibrium model, discover the market failure by calculating the unfettered equilibrium, and develop an explicit planning solution. Jean-Jacques Laffont is Professor of Economics at the University of Social Sciences at Toulouse. 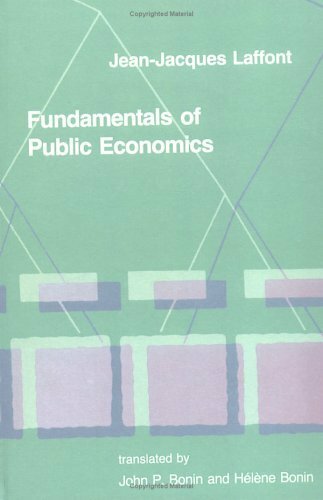 Fundamentals of Economics may be used in either an advanced graduate-level course in public economics or in conjunction with a second volume forthcoming by the same author in a course in advanced microeconomics.